A James Brown fan, I had great trepidation when the filming of "Get On Up" was announced last year. Who was directing again? Who would be in it? How much of Mr. Brown's womanizing, drug abuse and domestic violence would be shown? How much of the Godfather Of Soul's black pride, self-determination, political activism, confidence and independence would hit the big screen? I can say that all of these are shown mostly in proportion in Tate "The Help" Taylor's biopic on the life of James Brown. The results? A dynamic, entertaining and dizzying portrait of Mr. Dynamite. The films speeds by like one of the hyperenergetic extravaganzas of the showman himself. Mr. Brown died in 2006 on Christmas Day, and Mr. Taylor and the Butterworth screenwriting brothers John-Henry and Jez resurrect him to the big screen respectfully, capturing the essence, dignity, confidence and heart of a true American legend and hero. "Get On Up" is a kaleidoscopic look at key events shaping Mr. Brown's life, from his hardscrabble days as a child under the thumb of an abusive father and abandoning mother, to his emergence as a singular music genius who revolutionized soul, r&b and rock, to the iconic figure who set an unattainable standard the music world still struggles to grasp and emulate, to the relentless perfectionist who became imperfect. Mr. Brown's deep, profound global influence on music as we fully appreciate it today endures, and "Get On Up", produced in part by the Brown-influenced Mick Jagger and Brian Grazer, grasps and conveys this and the intellectual, spiritual presence of an artist at the peak of invention. Mr. Taylor utilizes parts of James Brown's life as revolving, continuous, ever-present markers fueling his success and persona. This approach works for the ambitious undertaking the director embarks upon. Mr. Taylor succeeds more often than not, though there isn't the depth and soul on a consistent basis that a figure the magnitude of Mr. Brown requires. Thankfully "Get On Up" doesn't succumb to an overemphasis on flamboyance and indulgence that other popular figures are often flummoxed by in biopic portrayals. Michael Mann's "Ali", for example, was drowned out by the title figure's womanizing and gift for gab, while his political stands in the film were tamed. Here Mr. Brown as an American treasure is given a little greater latitude, respect and standing by Mr. Taylor, who casts "Help" alumnae Viola Davis and Olivia Spencer in small but key roles. On occasion "Get On Up", which was approved by Mr. Brown's estate, fails to pause appreciably enough to bask in its hero's triumphs and political activism but it never fails to remind us where James Brown came from and what made him who he was. We glimpse Mr. Brown's contemporaries and forerunners, including Little Richard. One of their interactions, at a diner, is one of the few weaknesses of Mr. Taylor's film, a scene that rings sensationalist and irrelevant. A number of white directors have fallen afoul to tarnishing or compromising black musical powerhouses by disproportionately submerging them in their vices on film. Clint Eastwood did this in "Bird". To an extent this occurred in "Lady Sings The Blues". Taylor Hackford was a marginal exception to this vice-sinking with "Ray". Granted, an artist's peccadilloes and idiosyncratic signatures are easy big screen bait for curious and salacious-seeking if not unaware audiences. Some filmmakers however, underestimate the older viewing public's treasured (and sometimes sanctified) memories of their heroes, and do so at their own film's peril. On the other hand, any film that fails to depict a revered legend's flaws and complexities runs the high risk of exalting a false, sanitized figure, making for a disingenuous, inauthentic portrayal. "Get On Up" straddles this balance well enough, making James Brown entirely human, even if some surface aspects surrounding him linger. Admittedly, it's a challenge packing an entertaining film with the richness of character, experience and philosophy a real-life legendary icon commands. There's never consensus or universal satisfaction. "Get On Up" needed a little more depth and development in Mr. Brown's foundation and expounding on his ideas. The film is largely concerned with its feel-good determinism and music show reverie that at times the film is a concert rather than a chronicle. Above all, "Get On Up" defines Mr. Brown through his music, calibrating its story with eras of his music monikers such as "The Hardest Working Man In Showbusiness" and "Soul Brother No. 1". The artist's political activism is promoted not as its own separate entity but through his music, with songs like "Say It Loud (I'm Black And I'm Proud)". "Get On Up" does probe the politics of a racially segregated 1960s America and exploitive white record company executives and managers who profited off many highly-acclaimed and beloved black music megastars. In the film Mr. Brown is his own best counter-response to this practice. The performances in "Get On Up" are very good, notably Nelsan Ellis as Mr. Brown's front man vocalist and long-time close friend Bobby Byrd. Chadwick Boseman is superb as James Brown. He infuses the Hardest Working Man In Show Business with the certitude, charisma, industry and business acumen that cemented him as such a persistent, unmistakable force on the world stage. Mr. Boseman's performance isn't impersonation. He injects naturalism and a staggering ability to turn on a dime the way Mr. Brown himself did with boundless energy and a demand of second-to-none quality, uniqueness and originality. Mr. Boseman uses his character's individual status, revolutionizing it into positive can-do triumph and brand. It's audacious, assured acting. Mr. Boseman, a rising star who starred as Brooklyn Dodgers baseball legend Jackie Robinson in last year's poor, underwhelming "42", has arrived as a bona fide presence who I hope gets to show off his acting talent in films beyond true-life-sized figures. He will flourish. There's a chance he'll be on the shortlist of consideration for an Oscar nomination in 2015. The memory of this film may have faded by then but his work in it will not. 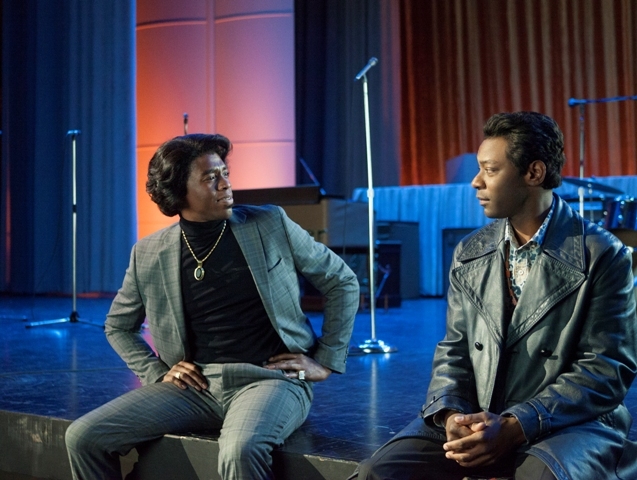 Watching "Get On Up" is pure foot-tapping, riveting, dance-in-the-aisles pleasure. I wish the film had been longer than its two hours and 20 minutes. With: Jill Scott, Aunjanue Ellis, Dan Aykroyd, Craig Robinson, Tariq Trotter, Aloe Blacc, Allison Janney. "Get On Up" is rated PG-13 by the Motion Picture Association Of America for sexual content, drug use, some strong language, and violent situations. The film's running time is two hours and 21 minutes.